An Example of Government Theft and Thuggery, or an Example of Drug War Lunacy? Politicians and bureaucrats are very creative in their pursuit of bad policy. In some case, I’m not even sure how to classify their actions. When the government squandered $224,000-plus for research on condom sizes, for instance, I thought that story easily could be classified as wasteful spending. But then I discovered the research was related to the fact that the government limits the types of condoms that manufacturers can offer, so maybe this was an example of mindless over-regulation. Now I’m facing another quandary about how to classify a story. I’m not sure to add the following nightmare to my ever-growing list of theft-by-government stories, or whether it belongs in my collection of stupid-drug-war stories. Here’s some background from a report in Reason by Jacob Sullum. It’s about a robbery at an airport. When he visited relatives in Cincinnati the winter before last, Charles Clarke, a 24-year-old college student, took with him $11,000 that he had saved from wages, financial aid, and family gifts because he did not want to lose it. He did not count on the armed robbers at the airport, who took every last cent as he was about to board a flight back to Orlando in February 2014. So did Mr. Clarke call the cops to report the theft? …the thieves were cops, who justified confiscating Clarke’s life savings by claiming his luggage and cash smelled like pot. But the cops didn’t arrest Mr. Clarke for possession of marijuana (they didn’t find any). Nor did they charge him with having smoked marijuana (I guess even cops realize that would be a pointless waste of resources). However, they did take his money on the very tenuous (and completely unproven) proposition that it may have been connected with a drug deal. Even more amazing, the burden of proof is now on Mr. Clarke to prove his money is innocent, so the presumption of innocence granted by the Constitution doesn’t apply! More than a year later, Clarke is still trying to get his money back… But the federal prosecutors who are pursuing forfeiture of Clarke’s money do not have to prove he was a drug dealer. …the government keeps the cash based on “probable cause that it was proceeds of drug trafficking or was intended to be used in an illegal drug transaction,” and the burden is on Clarke to recover it. Well, I’ve written many times that incentives matter. That’s true for taxpayers and it’s true for bureaucrats. And true for cops as well. …the number of seizures by police at the Cincinnati/Northern Kentucky International Airport exploded from a couple dozen a year in the late 1990s to nearly 100, totaling $2 million, in 2013. By pursuing forfeiture under federal law through the Justice Department’s Equitable Sharing Program, the airport cops can keep up to 80 percent of the loot while letting the feds do most of the work. This is so outrageous that even some folks who like big government are on Mr. Clarke’s side. Here are some excerpts from a report published by Vox. Under federal and state laws that allow what’s called “civil forfeiture,” law enforcement officers can seize someone’s property without proving the person was guilty of a crime; they just need probable cause to believe the assets are being used as part of criminal activity, typically drug trafficking. Police can then absorb the value of this property — be it cash, cars, guns, or something else — as profit: either through state programs, or under a federal program known as Equitable Sharing that lets local and state police get up to 80 percent of the value of what they seize as money for their departments. So police can not only seize people’s property without proving involvement in a crime, but they have a financial incentive to do so. Not only is there no presumption of innocence, the government actually puts the money on trial rather than the person. The Vox report also looks at the perverse incentives created by this system. …under the federal program, 13 different law enforcement agencies from Ohio and Kentucky are seeking a cut of Clarke’s $11,000 — even though 11 of those agencies weren’t involved in the seizure. The competition should show how lucrative these kind of seizures are in the eyes of law enforcement: they’re an opportunity to turn a costly counter-narcotics operation into a profitable venture for the law enforcement agencies involved (or even not, in Clarke’s case). And here’s a look at how different states approach the issue. 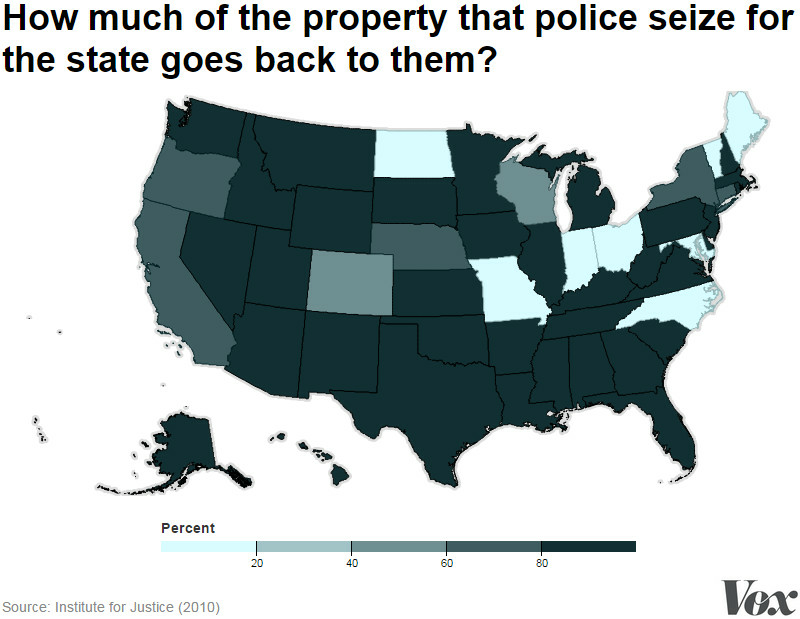 The darker the state, the bigger the incentive for law enforcement agencies to steal money. There’s also good evidence that these venal laws target minorities. A bulk of forfeiture cases also appear to disproportionately afflict minorities. Clarke, who’s black, said he felt like he was racially profiled. Of the 400 federal court cases reviewed by the Post in which people challenged a seizure and got some money back, most of the victims were black, Hispanic, or another racial minority. This is a good opportunity to say something about race relations. I don’t have any tolerance for racial grievance mongers like Jesse Jackson or Al Sharpton, and I don’t automatically assume racism when a black man like Eric Garner dies because of an interaction with cops. By the way, I’m not arguing that profiling is always illegitimate. As Walter Williams has explained, it’s sometimes just common sense. But if profiling – or even the perception of profiling – causes resentment, then doesn’t it make sense to make sure it isn’t being used promiscuously? Shouldn’t it be reserved for situations where law enforcement is seeking to protect life, liberty, or property? Needless to say, civil asset forfeiture and the drug war are definitely not good reasons to utilize a tool with societal downsides. P.S. Let’s shift to a different topic. I realize it might be a bit unseemly to do a victory dance in the end zone, but every so often it’s worth noting that folks on the left are spectacularly wrong in their analysis. I wrote, for instance, about Paul Krugman’s argument that the American economy would benefit from a housing bubble. Gee, that didn’t turn out so well. Here’s another example that’s been circulating on Twitter. It’s a snapshot on the famous economics textbook authored by Paul Samuelson. Like Krugman, Samuelson won a Nobel Prize, so he presumably had a very high IQ. 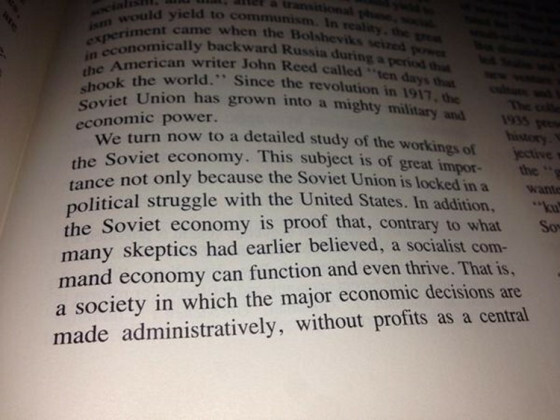 Yet just as the Soviet Union was about to collapse, he actually believed that the communist economy was thriving. Just goes to show you that Thomas Sowell was very insightful when he wrote that intelligence and wisdom are not the same thing. Like the war on poverty, the war on drugs is a failure. Nedlandp, thank you for explaining this to me.I was not intending to come off as not understanding how practical libertarianism is defined. Now, I think libertarianism is the most practical political philosophy. The “practical” label has more to do with income redistribution. 70% of government spending, not including interest, relates to safety-net payments, some of which are legacy commitments. We cannot renege on those commitments, nor can we renege on support to the needy, who have been conditioned to expect support. A true libertarian would not use government for support, but rather individual charity. The problem with that approach is that the associations that existed in the 1800’s to provide such community support have been totally replaced by government agencies. I would bypass those agencies using UBI payments that flow directly to citizens. Over time the growth in support levels would be reduced relative to economic growth. All legacy programs would expire over a 30-45 year span, satisfying paid commitments. I do drink a glass of wine or a bottle of beer each night, but I limit the intake of all legal drugs, including Vitamin I (Ibuprofen) and never use illegal drugs. If legal, I might have a marijuana laced brownie with some ice cream, if I ever want to get wild. I am sure that some of my friends will be happy to provide some second hand smoke, so I won’t be totally abstaining. Everyone should be free to make their own decisions. Nedlandp, you say you consider yourself a practical libertarian. How would that be best defined? The only real victims of drug use are the users, not society. I don’t know about you, however, I find it exceedingly hypocritical for some of the members in the U.S. congress to use these drugs while wanting to deny us the right to use them. Personally, I have never smoked Marijuana or tobacco, snorted cocaine, used Methamphetamine, drank alcohol or wine. Mainly because I have no desire to. Also, do you see the hypocrisy that I mentioned? If so, what are your thoughts? I agree, however, making it legal may mean government created monopolies or extremely high taxes. Either of which will leave the black market damaged but intact. If legislators act they may be motivated by potential campaign contributions or additional tax revenues, rather than real concern about the best way to transition to a freer society, where the individual takes personal responsibility. Conservatives are on the wrong side of this issue, one of the reasons I consider myself a “Practical Libertarian”. Nedlandp, I am opposed to the drug war. Personally, I believe drugs should be legal. Usage of these drugs is a victimless behavior. Gorbachev told Reagan that his country was out of condoms and needed a shipment of 12 inch condoms. Reagan said he would do so. However, he instructed the shipper to mark them all “MEDIUM”. Stories like this, and primarily the laws that support them, are extra confirmation that American individual liberty, and the prosperity it brought, are more a result of historical serendipity, not rational thought on behalf of the population. As such, it will be lost. At the macro level, America’s new subpar structural growth trendline is confirmation of this unfolding decline.